During the commercial break before Final, I ran out to the kitchen to grab a bottle of whiskey. Basil Hayden’s, to be exact. It was a preemptive move, because I knew one or both of our co-leaders would botch this situation. I’ll just jump right to the proper wagers. A tie heading into Final is the only situation in which playing for the tie is forced. Each player can choose either zero or everything. When it first came out that tiebreakers would decide regular games, I did an analysis of these past situations. Only 3 players had ever opted to wager nothing. And now that tiebreakers are in play, it has even less luster. Will catches a huge break here; a small separation between our two players might have doomed him. But both players came to win, and both went down swinging. Nothing to be ashamed of there – not at all. I would have preferred for Will to miss and win with a dollar. For a while I thought we would not have a 3 person FJ and I would get a bye. Instead, not only did Will pull himself out of the hole but he went from being in third place going into FJ to coming out the winner. 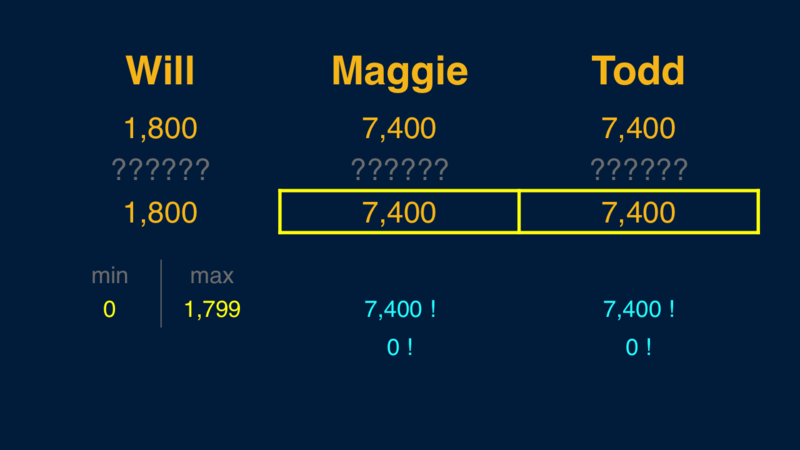 In the last 10 regular games (counting tonight) in which we had three players in Final Jeopardy we have the following result: In 1 case all three got it right = easy. 4 cases of 1 right + 2 cases of 2 right = 6 ok and 3 cases of 0 right = hard. So that’s a “final jeopardy degree of difficulty = just right” score of 60%. The “average degree of difficulty” score (higher is harder) increases to 1.90. No triple stumper today so the “no triple stumper on FJ” streak now stands at 3 days. While it might have been optimal in the past for both players to wager zero and guarantee themselves a win, I think it’s still optimal to wager zero. With the rules in place so that only one person can win each game, FJ turns into a zero sum game. Any equity that one player loses must be redistributed among the other two. 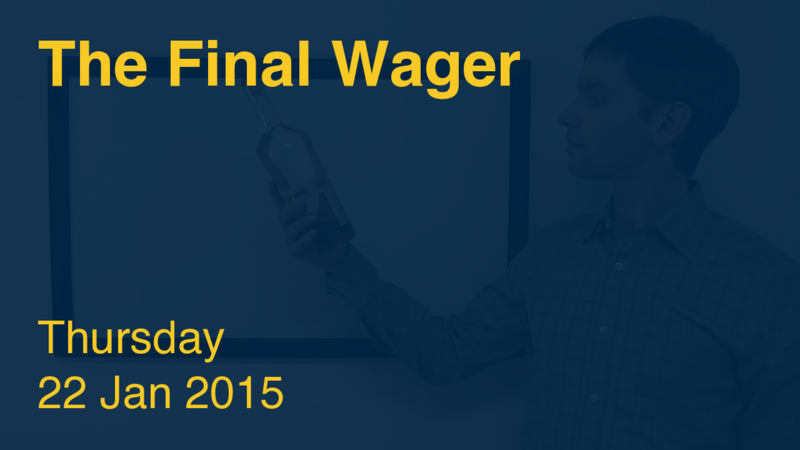 If both players wager everything, player three has some chance of winning, namely on a triple stumper/sole get. If at least one player wagers zero, then player three has a zero percentage chance of winning, and whatever equity he had must be redistributed between the two tied players. If you treat FJ like a series of three coin flips, the bet everything scenario results in the following win equity: 37.5%, 37.5%, 25%. If at least one of the two leaders bets zero, then the 25% equity player three had drops to zero, and each of the leaders gets bumped up to 50%. In reality, since the wagers are correlated, it’s almost certainly going to be even worse should you both wager everything. Using last season’s stats for example, third place would win on a WWW/WWR a shade under 33% of the time, making him virtually in an even heat with the two tied players. Frankly I think the two challengers made the dumbest bet of the year. Arthur Chu had it right. If a strategic tie guarantees you will move on to another day, swallow your pride and take it. You’re guaranteed an additional $1000 just for moving on. Hi Rick – there’s the rub: ties no longer result in co-champions, as they did with Arthur. Ties are now resolved using a tiebreaker clue. Thank you, Keith! Seeing discussion about these wagers had people railing left and right about that these were the dumbest wagers ever. I couldn’t see it – it seemed to me simple, tied players *must* wager everything, 3rd guy *must* wager all but $1 in case the tied folk miss. But, none of them could explain to me why what they did was the worst bet ever in ways that I could understand. So, I told myself that I’d wait to see what Keith says, since he can explain wagering to me in a way I can understand, and maybe he can explain why these guys are so laughably off the mark. You can’t imagine how pleased I was to see the three green backgrounds for their wagers – Keith agrees with me! You’ve made me a very happy Canuck. 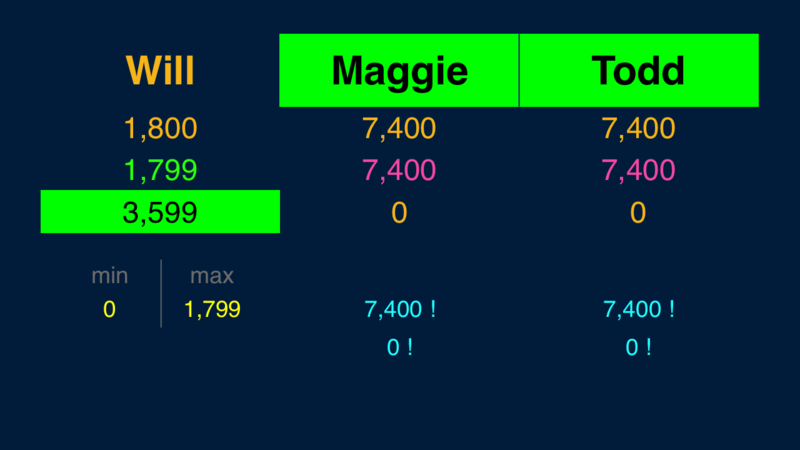 It seems that the final fleeting image before the credits showed Maggie getting $2000 and Todd $1000. If they were tied for 2nd, why didn’t they get the same amount? Was there a tie breaker question we didn’t see, or some other rule to determine the tie breaker for 2nd/3rd? Maggie led after the first round.